The Popcorn Fundraiser helps your Scouts’s Cub Scout Pack, Scouts BSA Troop or Venturing Crew earn the funds they need for a great program! Scouts who participate also learn important life skills like goal-setting, public speaking, teamwork and much more. The five best ways to sell, safety tips, selling script below will give you everything you need to sell like a pro. This is the most traditional way to sell; going door-to-door with the take order form, which you receive from your leader or council. Your customer chooses the product(s) he or she wishes to buy and writes the order on your form. You will collect the money when you deliver the product to your customers a few weeks later. This method is similar to Take Order, except you carry Trail’s End products with you to show to your customers as you visit them. The customer is able to select the products he or she wishes to buy from your product selection. You then hand over the product and collect the money right then and there. This is the best way to sell to your friends and family who live out of town. You can send emails to your customers asking them to purchase Trail’s End products online. Your customers click on the link in your email and can begin shopping right away. They order products online and pay with a credit card, and Trail’s End ships the products directly to your customers. Your mom and/or dad take an order form to their work place. Their co-workers write their order on the order form. Your mom and/or dad deliver product and collect the money a few weeks later. Advantages: Expands your customer base, and offices often need snacks and gifts. Your den, pack, or troop gets permission to sell in front of a retail store or in the local mall. You set up a display with products for people to purchase as they walk by. Have plenty of products on display for people to buy. Planning and conducting a strong program is the best way to keep your Scouts active and interested in Scouting. Funding that program is equally important—otherwise great plans can’t become a reality. The annual popcorn fundraiser is a proven approach to ensure that your unit can meet its program and financial goals while teaching your Scouts the importance of earning their own way. Units have used the monies they raise to cover the cost of badges and advancement, outings, trips, and summer camp fees. No Up-Front Costs: Units keep their commission and pay by December. Turnkey Program: Training, order forms, online ordering, Scout prize program, and other resources are provided free-of-charge. Proven Product Quality: Trails End provides superior, high-quality products. 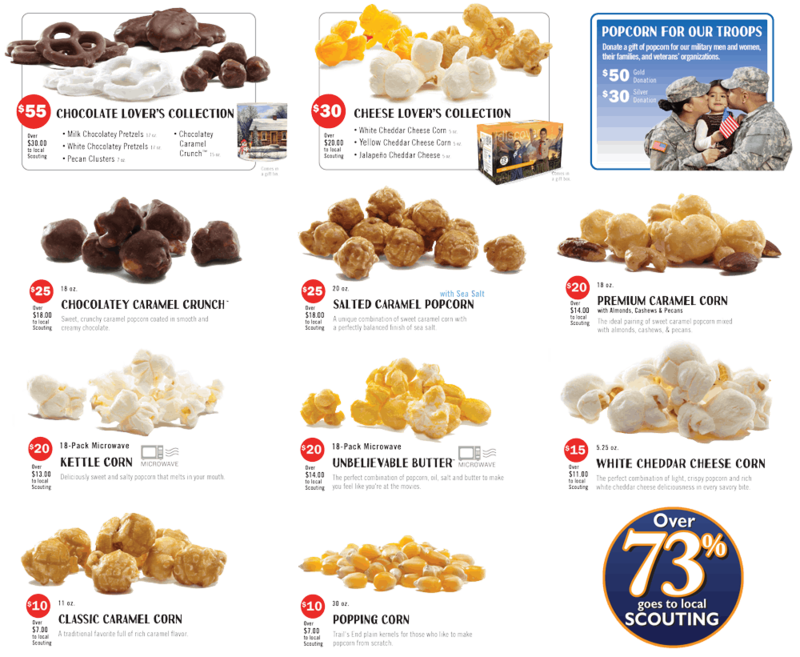 Always remember, however, we’re really selling Scouting adventures–popcorn is the thank you gift. Teaches Life Lessons: Earning your own way, salesmanship, confidence, financial responsibility, and leadership to name a few. 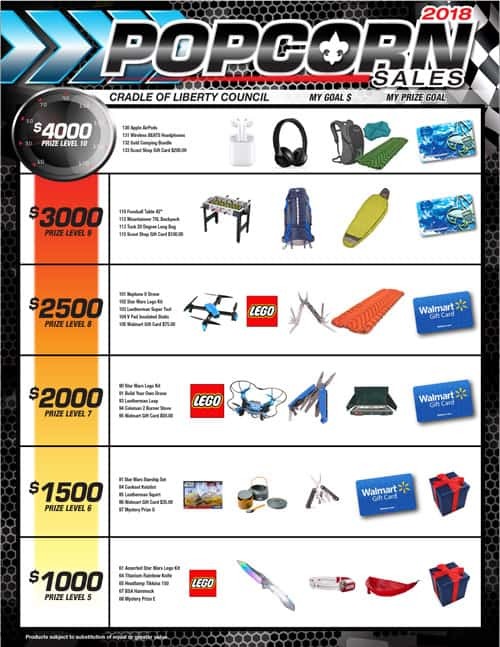 The fundraiser also provides opportunities for Scouts to earn advancements and merit badges. Support: The council popcorn team, made up of volunteers and staff, stand ready to assist your unit with a successful fundraiser. Over 73% Goes to Local Scouting: Not only does your unit raise the money it needs to fuel its program, but a portion of the sale benefits the council as a whole by helping us serve volunteer leaders and members by providing better programs and camping facilities. There aren’t assigned time slots; please show up some time between 8 and 10 AM. Please bring your patience and vehicle(s) large enough to accommodate your order. Remember, if you just ordered Military Donations for Order #3, there’s no need to go to pick-up! On October 6 or 7, 2018, many of our units will have a great opportunity to sell at a selection of Wawa stores in our area. 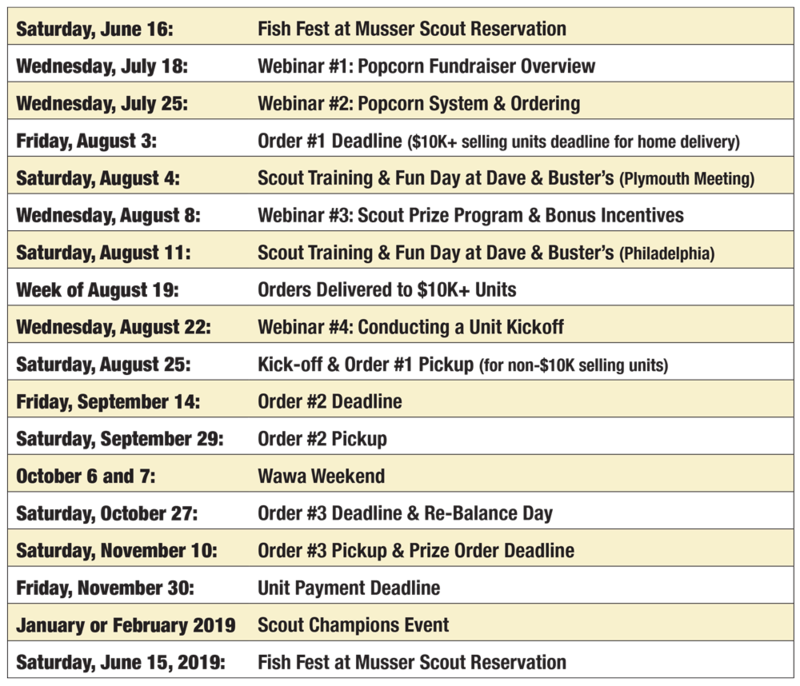 Wawa has graciously allowed Scouts this opportunity for many years at their available and approved locations, with site coordination through the local council. Through a partnership with SEPTA, our Scouts are able to sell at a select number of SEPTA stations in our area, listed below, through 10/21. If your pack, troop or crew would like to sell popcorn at one of these locations, please email your request to popcorn@colbsa.org with the date(s) and station(s) you are requesting. If approved (the date/location is not already spoken for) you will receive a copy of the SEPTA permit that must be displayed while Scouts are selling. All weekdays are available from 3 – 7pm, all Saturdays and Sundays the stations are available from 11am – 4pm. Make sure to select the **Popcorn Fundraiser email list in order to get the newsletter. To facilitate communication, as well as to provide a resource for units to post when they need additional Show and Sell product or have product to unload, we’ve created a Facebook group. It’s a closed group, so you’ll need to request to join. You’ll have access to the group once the page administrator approves your join request. At that site you will find detailed information about gluten, dairy, nuts, trans fats, etc. as it relates to the Trail’s End popcorn products. Log into www.scouting.trails-end.com with your established username and password. On the main menu, click the word PRIZE. Note that the main menu may show horizontally across your screen or may be a drop down when you click the word TUTORIAL. 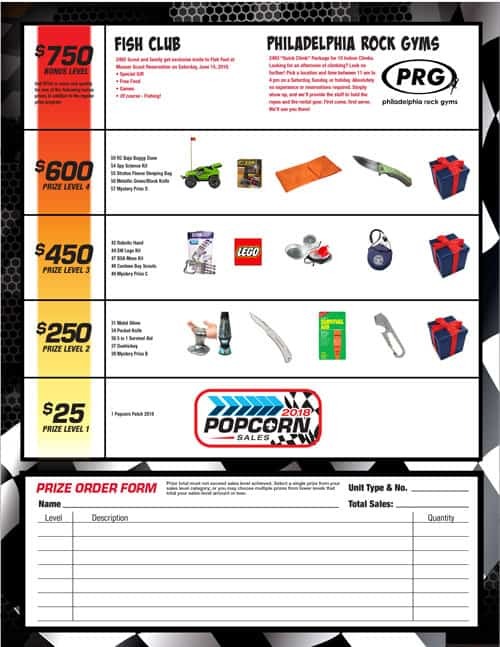 If any unit kernels are not able to access the prize system, please email popcorn@colbsa.org and we’ll assist you in setting up your account. Once you access the system, this video will help you navigate the system to place your order.